Nail issues are common in our practice, especially torn nails on dogs whether dewclaw or regular. Long nails can easily cause trauma to us and other animals and is most of the time accidental. Here are some tips to help keep your pet’s toes and nails healthy! Handling your pets’ claws is one of the most useful things you can do to improve claw care. No, this in not another post advancing my personal opinion on the fraught subjects ofdeclawing cats or removing the dewclaws ofdogs. Neither is it a finger-pointing diatribe warning pet owners that they neglect toenail trimming detail at their own peril. Instead, consider this is a friendly infomercial on the subject of claw health — because even the most pedestrian claw is a crucial body part. To wit, I’m offering you this collection of things you may not know about claws. 1. Unlike fingernails, claws contain nerves and blood vessels. Hence, the heightened sensitivity surrounding their manipulation and the reluctance most pets display when their paws are touched, irrespective of whether they’ve had a bad experience with toenail trims. 2. Claws are integrally attached to bone. The body works hard to ensure that the connection between claw and bone is as seamless as possible. That means that damage to the claw can impact the adjacent bony structures. Ouch! 3. Tumors like toes. For some reason, the rapidly dividing cells of a nail bed are a magnet for cancer — aggressive cancers, in particular. Malignant melanoma and squamous cell carcinoma are two examples of cancers that have a predilection for this site. And limping, loss of a claw or swollen toes are often the first signs that something is amiss. Smart owners would do well to know that keeping tabs on toenails is more than just about length. 4. Plenty of paw problems are age related. Younger pets are more likely to suffer trauma to their claws and paws, such as rips and fractures, during rambunctious activity. Meanwhile, older pets are more likely to experience the claw-specific effects of inactivity, hormonal changes, orthopedic problems and immune-mediated disorders. 5. Treating toenail issues isn’t always easy. As if it weren’t enough that paws are super sensitive under normal circumstances, treating painful claw conditions can be nearly impossible for some pets. That explains why veterinarians often resort to anesthetizing pets for what may seem like even the simplest of claw problems. 6. Self-trauma is the cause of plenty of claw problems. Just as we humans may chew our fingernails when we’re stressed, so, too, may some pets go to town on their paws and claws. Stress and even boredom can lead to excessive licking, for sure. Pets with lick granulomas, for example, can decimate their toes and sometimes their claws as well. Moreover, excessive licking and chewing from systemic illnesses like allergies can lead to conditions favorable for bacterial and fungal infections. 7. Not every pet needs a toenail trim. That’s true for active pets whose toenails are worn down in the natural course of their scratching or walking behavior. But when pets get older, reduced activity can result in overgrown nails. That’s why owners should try to trim claws throughout their pets’ lifetimes, regardless of whether it’s strictly necessary. You never know when things might change. 8. Your vet’s office may not be the best place for a routine toenail trim. Though you may be more concerned about all those needles at the vet clinic, the toenail trimmers are far more fear inducing for most pets. Which is why plenty of veterinary facilities (ours included) prefer that you keep routine toenail trimming where it belongs: at home or the groomer’s. Sure, we’ll do it if you ask, but we’d rather not ratchet up your pet’s stress level needlessly. A lower stress level really can enhance the outcome of many health care crises your pet might experience. 9. Paw handling matters. 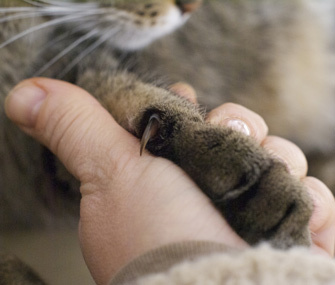 At the risk of soapboxing it, let me offer this final bit: Training yourself to handle your pets’ claws is perhaps the single most useful thing you can do to improve claw care. And to get there, you’ve got to train your pet to accept your ministrations. Easier said than done, I know, but now that every forward-thinking puppy kindergarten class teaches simple paw handling, we’re well on our way to making paw-shy pets a problem of the past. When you start handling your pet’s paws early in life (kittens, too), you’ll have established a connection between your love and his paws. And when that happens, exceptional claw health isn’t far behind.